​In early 2012, in response to a tripling of its MBA student population since 1995, the Wake Forest University Charlotte campus relocated to 30,000 square feet of space in the former International Trade Center Building at 200 North College Street. 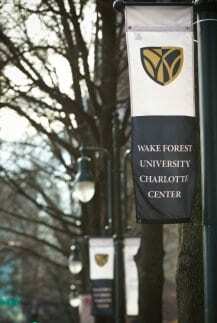 Residing near some of the city’s most influential businesses and corporations, steps away from the diverse shopping and dining options of vibrant uptown Charlotte, the Wake Forest University Charlotte Center provides urban convenience and state-of-the-art technology to the busy working professionals enrolled in our programs. The unique features and communal spaces of the Charlotte Center make it a perfect setting for the School of Business to host guest lectures, workshops, lunch & learns, and networking events. Pictures, videos and testimonials are good ways to start learning about Wake Forest’s Charlotte Center and facilities, but if you are considering one of our MBA programs, we encourage you to visit the Charlotte campus in Uptown. To plan a visit to the Charlotte Center, go to our Plan a Visit page for more information and visitor resources or call us at today at 888-925-3622.